The Museum of Teletext Art will turn 5 years old this summer. Since its launch in August 2014, the teletext-based gallery has broadcast artwork by more than 20 multimedia artists on Finland’s YLE Text. The Museum of Teletext Art began as a collaboration between public broadcasting company Yleisradio and Helsinki-based artists co-operative FixC. Announced alongside that year’s edition of the International Teletext Art Festival, its purpose was (and remains) to broadcast, document, archive and make teletext art available for studies and research. MUTA was officially opened at an event featuring the work of participating artist Kathrin Günter at FISH Helsinki on 20 March 2014. Günter’s piece Lindsay Lohan’s Mug Shot Cabinet was previously selected as winner of the 2013 International Teletext Art Prize. Artwork from the MUTA collection has been showcased on ARD Text, appearing throughout 2016 on the German service. A new piece was featured on page 883 each month, beginning with Dragan Espenschied’s Lucky Cat in January and finishing with Ryo Ikeshiro’s Retro Rick Roll in December. The twelve designs shown on ARD can be found here. 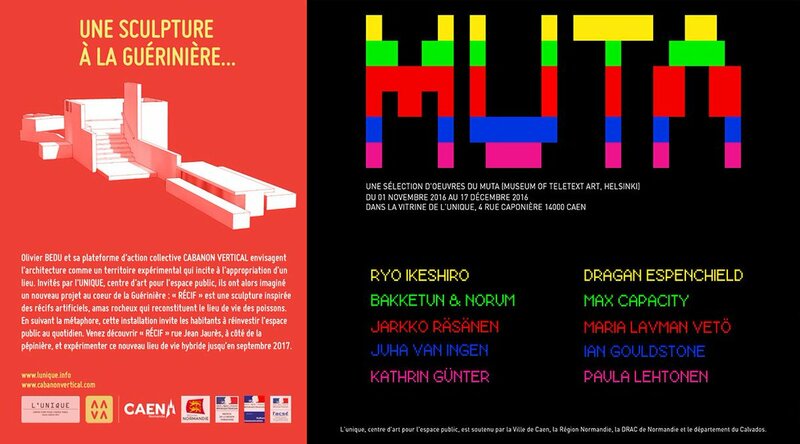 MUTA was also the subject of an exhibition at L’Unique in November 2016. 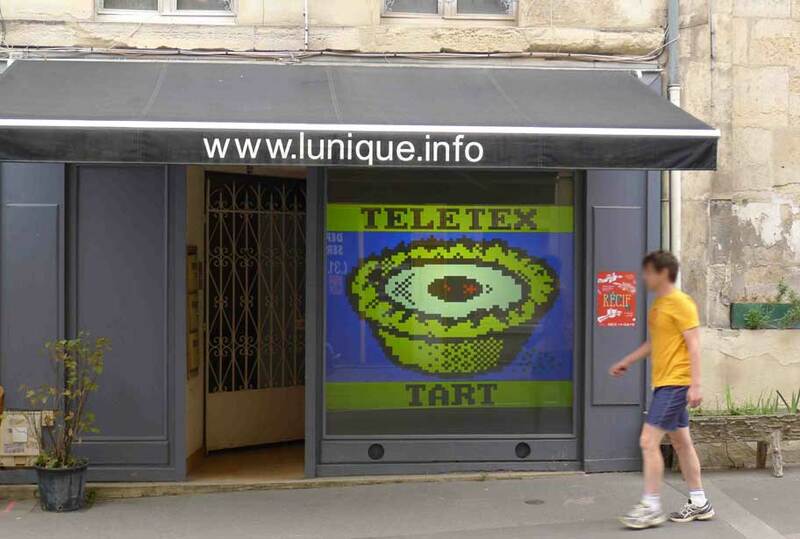 Visitors to the gallery in Caen, France were treated to a slideshow featuring the work of 10 teletext artists on a large public window projection. Teletext art at L’Unique, France. Those without access to Finnish teletext are still able to ‘visit’ the Museum of Teletext Art via YLE Text’s online viewer here. You can also see past works at this archive of the YLE service. Navigate using the date field in monthly increments to see what was featured on specific dates. Alternatively, here is a chronological list of every artwork featured by MUTA. YLE are rebroadcasting pieces from the collection on rotation, with Karin Ferrari’s DarkTXT – a tribute to the dark web – currently featured.